The Motor Party departs for the South Pole - Oct. 24th 1911. 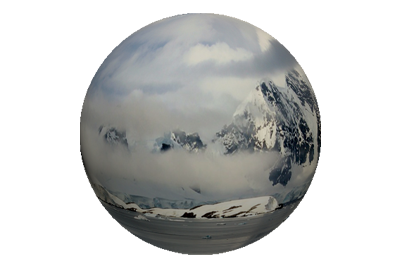 Unbeknownst to Scott, Roald Amundsen’s team had been to, and passed their own supply cache at 81º S on the very same day, having begun their outward quest on October 19th. Amundsen had every confidence in his planning, his dog teams and his ability to beat Scott to the accolade of being first to stand at the South Pole. He was perplexed by Scott’s insistence on using ponies to haul supplies, instead of more efficient dog teams. Amundsen had set off with over 50 dogs, the weakest of which would be fed to the other beasts, to sustain them along the route. The pony leading team that departed Cape Evans on November 1st were – Scott, Wilson, Bowers, Oates, Atkinson, Cherry-Garrard, Wright, Edgar Evans, Keohane and Tom Crean. 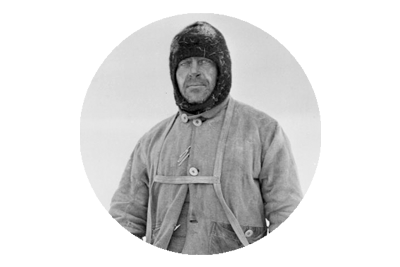 Not only was Amundsen’s ‘dog eat dog’ policy, and earlier start a huge advantage to the Norwegian team, but so too was the fact that they had established their base camp, Framheim, in the Bay of Whales, one degree closer to the Pole than Scott’s base at Cape Evans. Despite the huge odds in his favour, it seems Amundsen had one nagging concern regarding Scott’s challenge – the Motor Party. He fretted endlessly about the possibility of their performance and the advantage these machines, pulling three tons of supplies, would afford his great rival. Perhaps this was the reason he launched a first attempt on the Pole on September 8th that year, despite the forebodings of his men. The effort was abandoned not long after they had reached their first supply depot. In temperatures close to -60º Celsius, the dogs began to freeze to death and frostbite ravaged the group. A hurried retreat soon became a desperate battle for survival, and reduced Amundsen to the ignominious act of abandoning his party, to secure return to Franheim on the first sledge. Having licked his wounds and dealt with the fallout from the inglorious abandonment of his first effort, Amundsen wasted little time in launching his second attempt and duly set of on October 19th, still fearful Scott’s machines would give him the upper hand. He need not have worried. The better of the two motors had broken down on October 17th, and a rather annoyed Scott was quickly losing faith in the ability of the machines to prove of any worth to the mission. Repairs were completed on October 22nd and Scott planned for their departure the following day, but a severe turn in weather conditions prevented this. The following day however the wheels of the mechanical departure were finally set in motion, and the motor party shambled southwards. If Amundsen was nervous about the proficiency of the machines, then so too was Scott. Whereas the Norwegian was fearful of the impetus they could give to the efforts of the Terra Nova party, Scott’s misgivings that they may prove worthless, were soon to be realised. ‘The Motor Party’, from left to right William Lashly (chief stoker).’ Also Lieutenant Edward Evans (second in command and navigator), Bernard Day (motor engineer) and F.J.Hooper (Steward), dated October 1911. Scott had been in France in 1908, where he and the French Polar explorer Jean-Baptiste Charcot had first tested the motor sledges being developed by two French companies. It seems both men would have gone to any length, other than realise the usefulness of dog teams on ice. Charcot had a successful test run on a 200kg machine, but when Scott tried his luck with a 750 kg motor, it sank and stalled in the soft snow. Unperturbed by this experience, Scott brought three of the machines with him on the Terra Nova, obviously swayed by the prospect of the huge loads they could transport, if conditions were favourable. 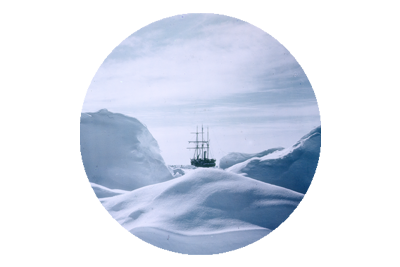 Having made landfall at the newly named Cape Evans, in early January 1911, the crew began the laborious task of transferring supplies and equipment from the ship,to the site where the hut was being erected, one mile away, across the ice. During this operation one of the motor sledges plunged through thin ice and was irretrievably lost to the frigid fathoms below. With only two of the machines left for the Southern Journey, Scott opted to use them as sparingly as possible, until their departure on October 24th. Scott and his team were following in the machines tracks for three days, when on November 4th, even before they had reached Corner Camp, they discovered one of the remaining two motor sledges, beyond repair and abandoned on the ice. Lieutenant Edward Evans had left a note informing Scott of a broken cylinder. Two days later they stumbled across the second abandoned engine, and a similar missive from Evans. “I find myself immensely eager that these tractors should succeed,” Scott had earlier wrote. Now his hopes lay in tatters, a little over 50 miles from Cape Evans, and 120 miles short of their initial destination. Somewhere ahead of them, deep in the unforgiving clutches of Antarctica’s icy white landscape, Evans, Lashly, Day and Hooper were man hauling the sledges, since November 1st, dragging what they had determined were the most valuable of the supplies, and leaving the rest with the crocked machines. It was a disastrous beginning to the Southern Journey, as the ‘Motor Party’ had now become the first man hauling team on the outward leg, and the ponies were now dragging sledge loads, far in advance of predetermined plans. Captain Scott and members of the Southern Party pose in frontof Mount Erebus during the early stages of the Southern Journey. Tom Crean stands on the far left. Sources – An Unsung Hero, Michael Smith. Scott Of The Antarctic, David Crane. With Scott To The Pole – The Photographs of Herbert Ponting. Natural History Museum. 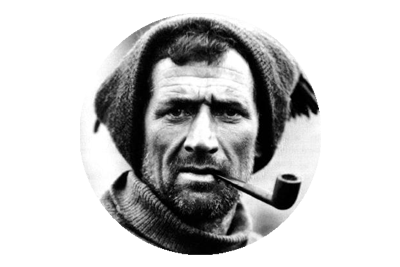 Pingback: Scott's Diary - November 4th 1911 - Terra Nova Expedition.